This week’s recommended children’s app is Just Joking from National Geographic Society. 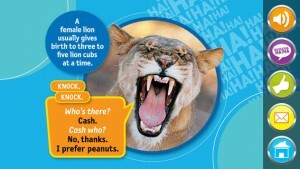 The free app download gives you a sample of 25 kid-safe jokes. Additional “laugh packs” of 100 jokes can be purchased for $0.99. Expect to see random jokes while learning about subjects such as animals, science, space, or weather. You can even shake the phone to get a random joke. With knock-knock jokes, tongue twisters, riddles, cross-the-road jokes, and more, Just Joking is perfect for any road trip or rainy afternoon. Laughing animals, goofy people, and other colorful illustrations are paired with fun sound effects and interactives and presented in our signature eye-popping color palette and dynamic photo-driven style. Parents can rest easy knowing that each joke is age-appropriate and handpicked by a brand they know and trust: National Geographic Kids. What children’s apps do you recommend? Please add it to our Recommended Apps for Kids directory. To share an app, fill out our simple form below. Once you complete it, your app suggestion will be stored in our growing database of great apps for kids. We will use this directory to plan features and share new digital tools with our readers. You can also download an Excel version of the directory to sort the results for yourself.